Bringing together the rich flavours of warm butternut squash and creamy mozzarella, this dish is sure to impress guests during the holidays. 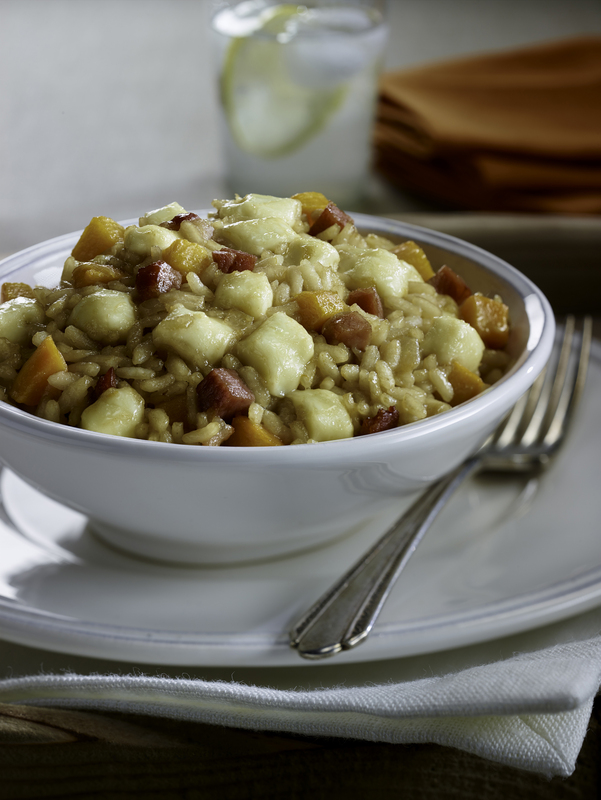 Created by TV host and cookbook author, Sabrina Tutino, this risotto works well as a main or a side for any festive get‐together. You can also try using vegetables like sweet potatoes or pumpkin instead of squash for different flavour variations. More great recipes can be found online at http://www.mozzarellissima.ca. To prepare the squash, first remove seeds and cut into slices. Then remove the skin and chop into small cubes. In a large saucepan, sauté the onions with olive oil. Once the onion is lightly browned, add the squash, season with salt and simmer for 15 minutes, until the squash has softened. Add the rice and mix well to prevent it from sticking. Cook for 10 minutes, until it becomes translucent. Two minutes before the end of the cooking, add the butter and cheeses. Mix well and let sit for 2 minutes before serving. Season with pepper to taste. ‐ Using rice that is rich in starch will make the risotto rich and creamy. ‐ You can also use beef broth instead of vegetable broth. ‐ Taste the rice to check when it is ready. The centres shouldn’t be hard, but “al dente”.